My family knows our diet in Seoul is tragically deficient in Japanese-style raw fish (soft, not chewy), so as soon as we arrived, sushi, sashimi and poke were shoved at us until we could eat no more. No objections here! This platter is from Kuru Kuru, a newcomer to Hawaii's conveyor belt sushi scene. Huge cuts of fish, unbelievably low prices, great taste. What's not to like? Impressed with their take-out, we later visited the restaurant, twice, where two people can eat quite well for $40, including tip. 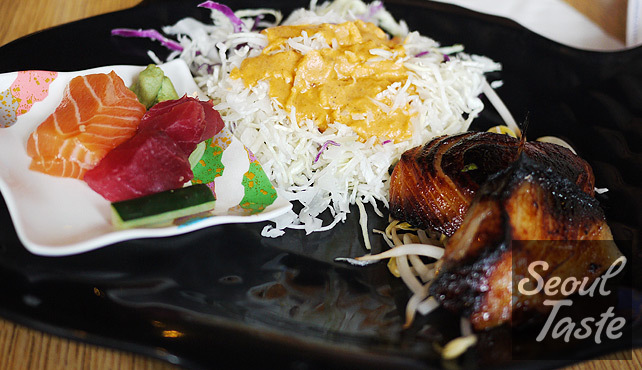 You probably know sushi and sashimi, but poke, a local variation, deserves some explanation. First of all, as in sake (the Japanese liquor) the final 'e' is not silent (in Hangul it might be spelled 포케). 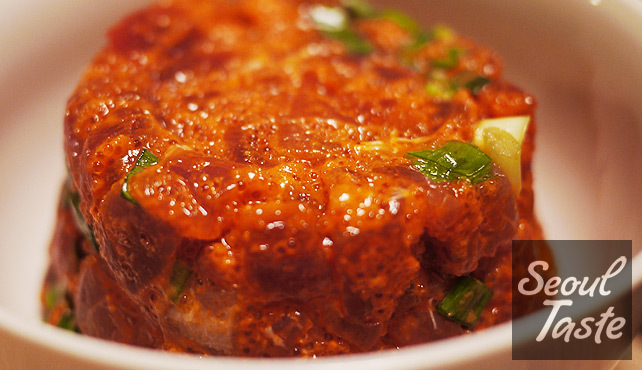 The dish consists of somewhat-less-than-sashimi-quality fish, cubed and marinated, and often chopped onions are added for a fresh flavor and crunchy texture. Most supermarkets and grocery stores offer some kind of poke, this one happens to be from Safeway. It's spicy tuna, which, as we have discovered, appears to be an American invention (which would explain why we can't seem to find any spicy tuna in Seoul). 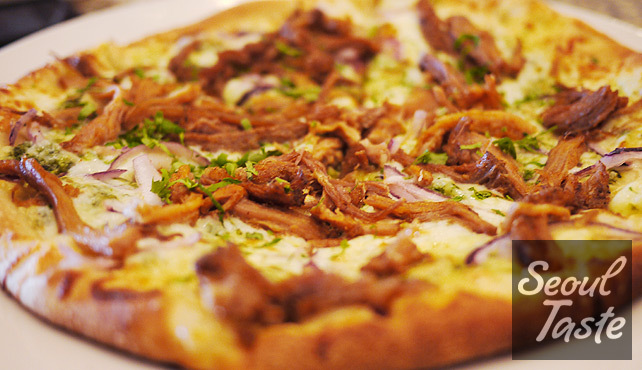 As we have been having some disagreements with the local CPK in Gangnam, we revisited our old CPK in Honolulu, at the world-famous Ala Moana Shopping Center. Ala Moana is said to be the world's largest open-air mall, which sounds plausible to me, as there aren't a lot of cities that both (1) have the population and/or visitor traffic to sustain a gigantic mall and (2) have the kind of weather that makes an open-air mall feasible. In any case, world's blankiest blank or not, Ala Moana is a truly gigantic mall, big enough to have four major anchors (Macy's, Nordstrom, Neiman Marcus, and Sears) separated by more than 300 shops and restaurants on three levels. Anyway, we pulled up a chair at the bar and were greeted warmly by a server who still remembers us, even though we now stop by just once a year. I confidently ordered my favorite pizza, the Buffalo Chicken, only to find that it had been discontinued months ago. Ah well... it was definitely a quirky item and I can see how I could have been one of very few to have appreciated its charms. Although were totally stuffed, as usual, you can't miss the desserts at CPK! 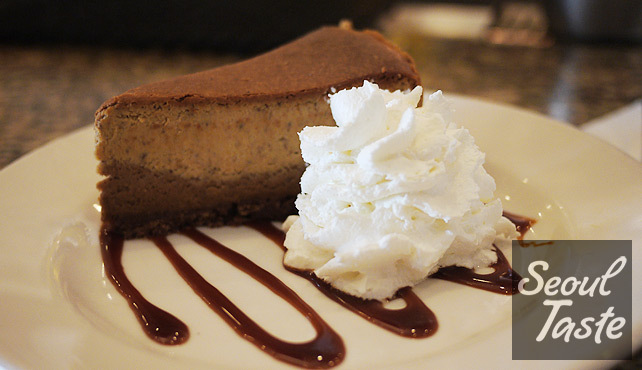 The Chocolate Banana Cake is difficult enough to turn down, but in the fall, it is impossible say no to our all-time favorite CPK dessert, Pumpkin Cheesecake! It is a seasonal menu item, and became available just a few days before we arrived. Since we couldn't spend Christmas in Hawaii this year, my mom decided to stage a sort of early Christmas for us. Over the years, homemade waffles have become a Christmas morning tradition in our family, as well as a curious cardboard fireplace. Why the fake fireplace? So we have a place to hang our stockings, of course! 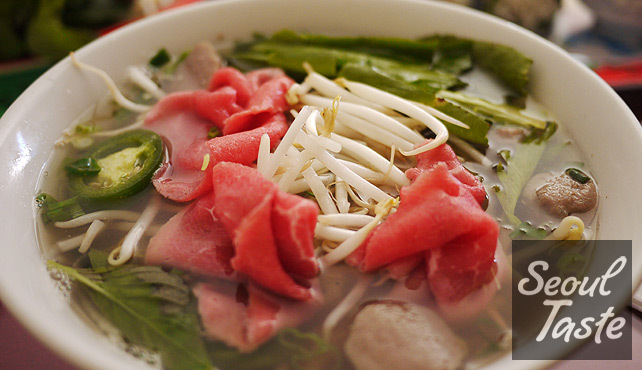 At one point, we used to go to Pho Bistro 2 every Satuday, and sit in the same place and order the same thing (what you see above, pho with rare steak and beef balls). We didn't have to say a word, our seat would be there and as soon as we walked in they would place our order for us, sometimes even without confirming. The restaurant is clean (to a fault) and their food is consistently good, so we recommend it without hesitation. They also offer a wonderful (if enormous) take on a local favorite: oxtail soup. Like other places in the U.S. right now, food trucks are hot, hot, hot! Especially this one: it's got a brick pizza oven in it! Who knew you could build a mobile brick oven and tow it around with a pickup truck? 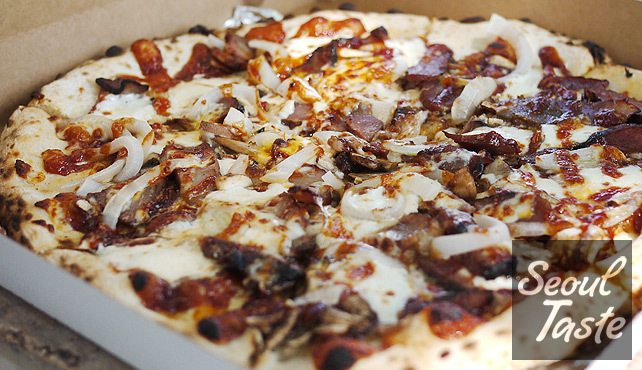 We only got to try one pizza from it, but it was incredible. The Counter is a place I think about often. It can be quite a challenge to find a good burger in Korea (to say nothing of getting fries and a shake along with it). This is probably a good thing in the context of my health, but when I'm back home, it's just for a couple weeks, so I let myself relax a bit. 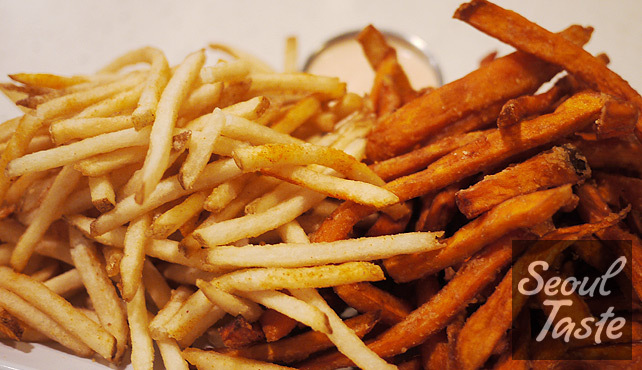 Starting with this gigantic plate of fries, half regular and half sweet potato. At the Counter, the quality of the patty itself is actually not the best (although I am always pleasantly surprised these days when anyone asks me how I'd like my burger cooked). It's not the portion size either, as American portions now seem way too enormous (I try to eat them anyway, but it only makes me feel sick). No, what I enjoy about The Counter is building my own burger, without all the work. In this case, I built a custom BBQ burger. You pick the bun, the meat and weight, toppings, sauces, and more. No matter what kind of crazy combination you pick, the wizards in the kitchen somehow take it and build something beautiful and delicious. As it turns out, one of the bun options is "none." 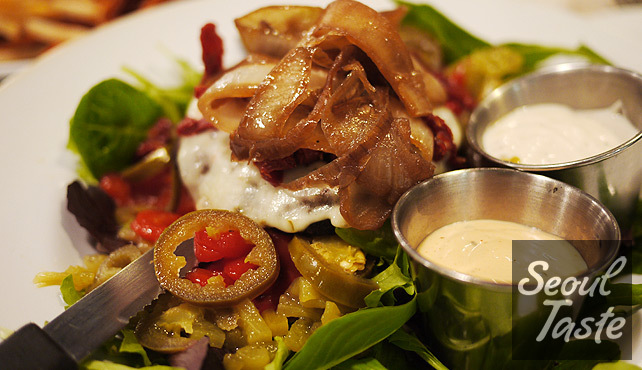 If you choose that, you get a kind of burger salad, which is Annie's usual. 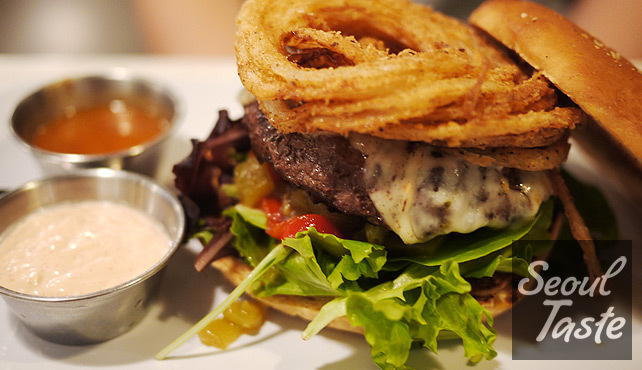 So far, The Counter is the only place I know of that offers the burger salad. Yotteko-ya claims their Kyoto-style ramen takes years off your appearance. Whether that is true or not, the ramen is certainly delicious, and I haven't yet found anything remotely like it in Seoul. 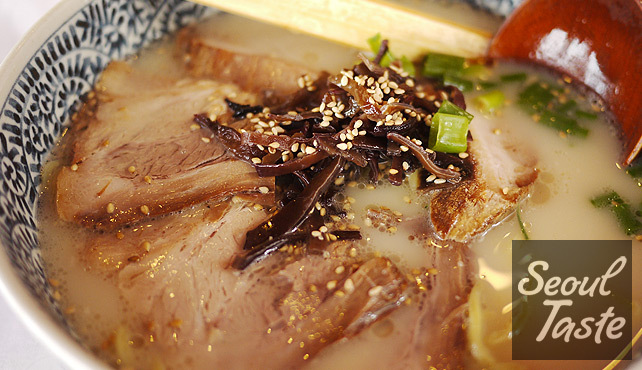 The soup is thick and flavorful, yet somehow not eggy, greasy or overly salty, as other thick ramen soups can be. There are many options, including loading up on the perfectly cooked, melt-in-the-mouth, charsiu pork, I actually prefer the vegetable-heavy version (yasai paitan), with only one slice of pork. I guess I really like the added texture of crunchy cabbage and bean sprouts, the way broccoli somehow picks up the soup, and my favorite mushroom, black "tree ear" fungus (sounds delightful, I know). 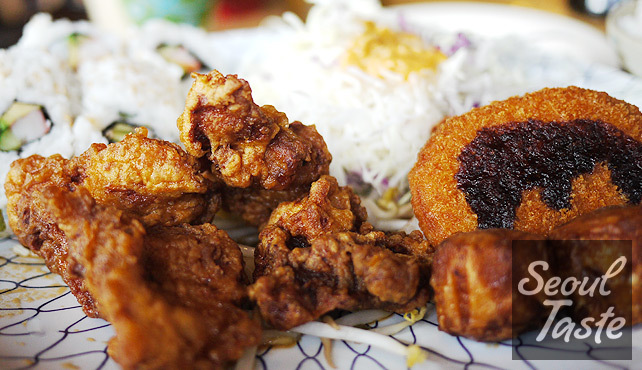 Some may disagree, but I think Yotteko-Ya has some of the best chicken karaage. Sometimes less than photogenic, but always delicious. Like all of the best fried chicken, it manages to include just the right amount and the right kind of fat to be delicious instead of disgusting. California Beach Rock 'n' Sushi: The name is quite a mouthful, but aside from shortening it to CBR&S as we do, there's not much else you can do to make it easier. By night it is a sushi bar, albeit kind of a casual one. 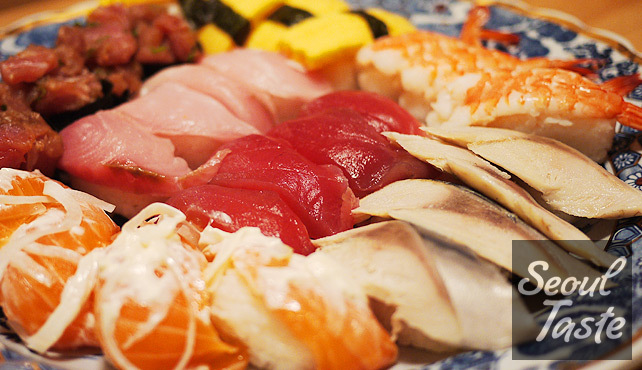 Their sushi is good, but when we're looking for the perfect sushi dinner, we go to Sansei. Our favorite thing about CBR&S is their lunch combos. The Super Lunch Combo is not quite as super as it used to be. I swear they used to give 20+ pieces of chicken... this time I got just 4 or 5, and it was more expensive to boot. Still, there's something special about the chicken that I haven't found anywhere else. 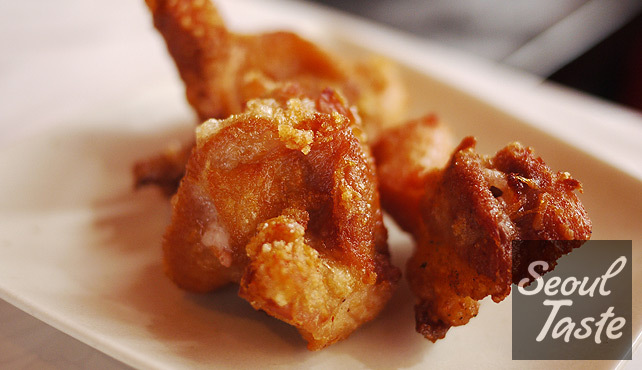 They call it chester chicken: little bite-sized bits of boneless chicken, battered and fried until lightly crispy, then seasoned with a sweet, garlicky sauce. I suppose now that my appetite is Korean-sized the portion is just right. In addition to the chicken, you get a few small California rolls, a piece of fried chicken, a croquette, a salad and rice. Annie's usual, the butterfish combo. The portion is small (by U.S. standards anyway), and also has been getting more expensive over the years, but it's still a good choice. Ichiriki is a Japanese hot pot restaurant that is quite well-known locally (reservations recommended). We ate here with friends who had visited us in Seoul earlier in the year. 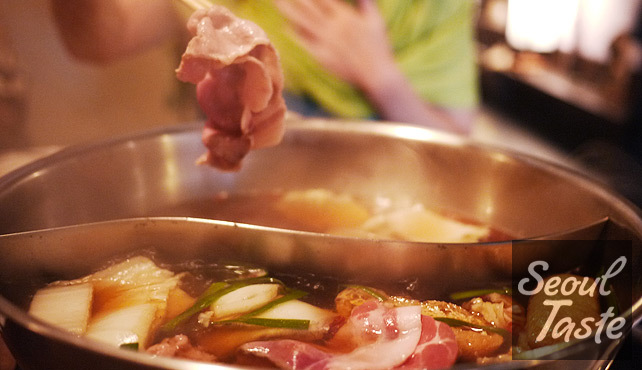 If you've had any kind of hot pot elsewhere the concept is similar: you order a soup base and a set of meat and vegetables, then cook and eat at your own pace. It's nice that they have divided pots, so everyone can choose their own soup. I decided to save the best for last. It's not chronologically last, as we ate it twice, once per weekend (Pineapple Room only serves breakfast on weekends). 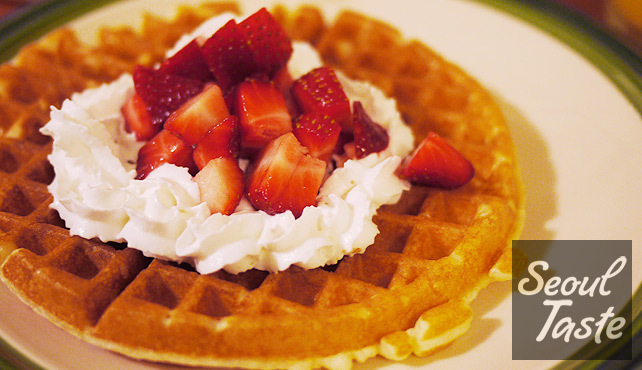 This is pretty much our favorite breakfast in the whole world, no qualifications needed. Words don't do it justice, but here we go. A patty made with Taro and kalua pig (Hawaiian-style roast pork) plays the role of the English muffin here. 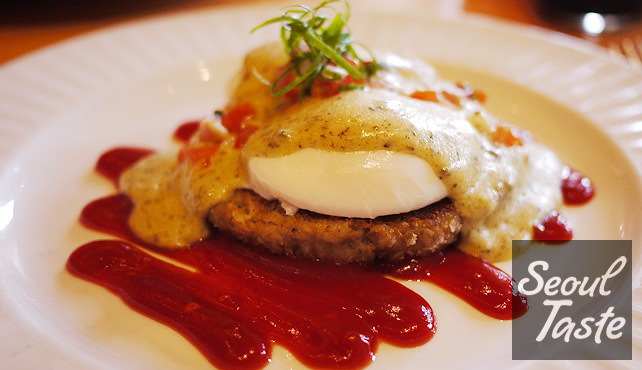 Poached eggs, of course, but also fresh pico de gallo are added on top, then the tradition Hollandaise sauce is enhanced by the addition of a minced luau leaves. As a final touch, the spicy Tabasco-infused ketchup on the plate adds some color and heat. Annie has replicated this at home, but it takes days of prep and hours of work to make (Step 1: Roast the pork...). 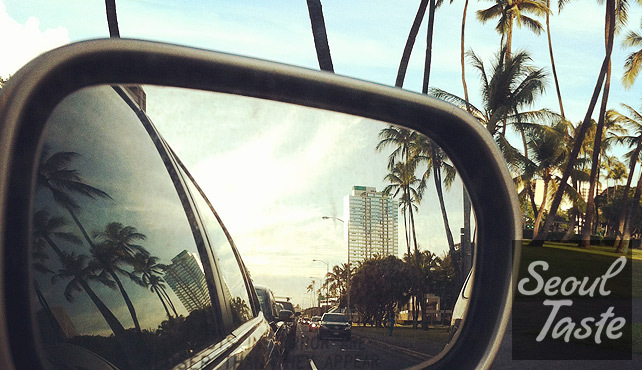 When we're in Hawaii, we'd rather pay our $11 and have it made for us. Going home for a bit was nice, but like last year, it wasn't nice enough that I wanted to stay. All that driving, everything so far from everything else; slow, flaky internet; slow, flaky package delivery; the body wash and shampoo is all smell and no soap. Some days, I even felt my dad's house was just too big. I guess I have grown to like our tiny officetel. That's it for this trip, but we will be going back again in December & January for the holidays. If there's anything you'd like to hear more about, or if you think you might be visiting Honolulu soon, or if you know where to find any of this in Seoul, let's hear it in the comments!